Perfect for keeping sore, painful or clicking wrists in check or to help prevent injury when doing heavy bench press and other weight lifting movements. Excellent for after injury, keeping sore, painful or clicking wrists in check or to help prevent injury when doing heavy bench press and other weight lifting movements. 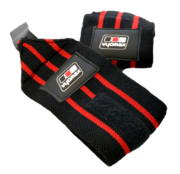 12" x 3" heavy duty elasticated wrist support with a thumb loop for a more secure fit and an adjustable touch fastener to firmly and comfortably support the wrist whilst training.